We are Skydive OBX and have the best view if you want to Skydive North Carolina. We are an exciting extreme sport company here on the Outer Banks, established in 2011. We love giving people the thrill of a lifetime and watching them have a great time. Plus we get to jump out of a plane all day! Skydiving in North Carolina has never been as beautiful as this. Skydive over the Barrier Islands of the North Carolina shoreline with amazing views of the beach and ocean. We offer Tandem skydiving which is one of the best ways to experience a thrill like no other, no prior skydiving experience needed, and only a little bit of training. So come see us over at the Dare County Regional Airport beside the NC Aquarium in Manteo, NC on Roanoke Island . Yo u will have the time of your life, right here on the beautiful Outer Banks of North Carolina. We are located right next to the main terminal building at the airport on Airport Rd. Just follow the signs to Skydive OBX. 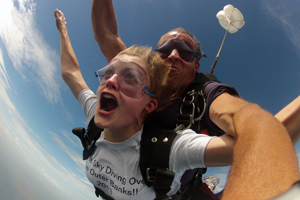 We are the only skydiving facility to offer skydiving on the Outer Banks and surrounding areas, so come jump with us.